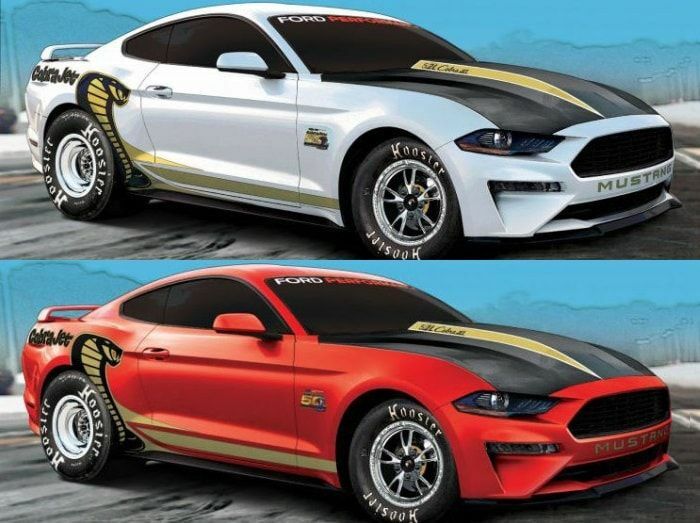 Earlier this week, the 2018 Ford Cobra Jet Mustang officially went on sale and Ford Performance issued the first images of the new purpose-built drag racers, but if you want one, you will need to order soon and be prepared to spend big money. Back in 1968, the Cobra Jet Mustangs were among the quickest cars in the world of super stock drag racing and over the course of the past decade, Ford Performance has offered up a modern version of the Cobra Jet package. These cars are not street legal, so they come with a serial number rather than a VIN, but for someone who wants to go factory super stock racing, the Cobra Jet is one of the quickest packages on the market today. For 2018, the Ford is celebrating the 50th anniversary of the Cobra Jet package with a limited run of 68 race cars which when properly-configured and well-driven will run down the quarter mile in the mid-8-second range. For 2019, Ford Performance has rolled out a new Cobra Jet, featuring the exterior styling of the newest pony cars with a heavy dose of drag racing modifications. The hood has a unique cowl induction-type design that makes plenty of room for the supercharged V8. Out back, the rear wing of the Shelby GT350 is featured and along the sides, we can see the race-ready wheel-and-tire package as well as the classically-designed Cobra Jet artwork. The front fenders also have unique 50th anniversary badging and the cars can be ordered in Oxford White or Race Red. Under the hood of the 2018 Ford Cobra Jet Mustang is a supercharged 5.2-liter Coyote (cross-plane) V8 mated to a rear-prepped automatic transmission. The power is sent from there to the Ford 9-inch solid rear axle from Strange Engineering while a unique four-link rear suspension helps to keep the sticky drag slicks pressed to the ground. Ford Performance will also add a NHRA-certified roll cage, Racetech seats, and a drag race-tuned coil-over suspension with specially designed Weld Racing wheels. These cars are built to race, so you wont find things like a radio, heater or interior comfort features, but if you want to buy a race car and go super stock drag racing with a car that is built to run mid-8s, the Cobra Jet Mustang is one of the best options on the market today. Of course, there are some downsides to the 2018 Cobra Jet Mustang. Most notably, only 68 examples will be built and they will sell quickly, even with the price tag that is likely to be in the $100,000 range. Ford has not openly announced the pricing, but based on past prices and the prices of the 8-second drag strip packages for the Chevrolet COPO Camaro and the Dodge Challenger Drag Pak, the new Cobra Jet is almost guaranteed to be in the six-figure range. So, if you have that kind of money to spend on a car that you will never be able to legally drive on the street but you will be able to compete in the NHRA Super Stock divisions, you will want to contact your local Ford dealership as soon as possible to begin the ordering process for your 2018 Ford Cobra Jet Mustang.